Chemical Constituents and Components : Main chemical components are triterpenoid saponins, senegin, polygalic acid, sapogenin, sengins, phenolic acids, methyl salicylate and polygalitol. Saponins: 4. It significantly reduces the level of blood triglycerides. 5. It reduces the high blood sugar level to normal without altering the insulin concentration. 6. It inhibites glucose absorption by suppressing the transfer of glucose from the stomach to the small intestine and by inhibiting the glucose transport system at the small intestinal brush border. 7. It causes increase in antibody producing cells. Curing Diseases : 1. 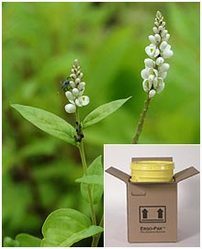 It is used in bronchitis and asthma. 2. It treats bronchitis, tracheitis, emphysema and inflammation of the respiratory tract. 3. It is used for treatment of rheumatism, colds, inflammation, and bleeding wounds. 4. It stimulates bronchial mucous gland secretion. Possible Combinations : Senega + alfalfa + glycyrrhiza glabra + matricaria chamomila + sarsaparilla + dandelion + saw palmetto + gentian + thyme (energy booster).